The project was to restore the fountain by running a power lead to an electric pump which will aerate the pond and power the fountain to provide a very attractive feature in what is a well- used garden. When the project commenced we discovered that it was necessary to replace the existing power supply. This was achieved by coming to an agreement with NYCC to have a feed from the street lighting column. This involved some unexpected work and then we discovered leaks in the pond and other work, so the job was much greater than we had expected. Remove or prune some trees and shrubs which are shading the rose garden. This made the rose garden more visible from the adjoining road. Provide an interpretation board relating the history of the rose garden and the biography of the man who created it in 1883. Work was completed in 2015. The Red Lea Hotel sponsored the replanting of part of the Prince of Wales Gardens. Volunteers worked to clear the area to the east of the larger colonnaded shelter. This area was overgrown and contained lots of brambles. In May 2012 volunteers replanted the rockery and it is hoped that the plants will become established so that in future years we will all be able to enjoy this sheltered sunny area of our gardens. In November volunteers planted lots of tulips and hyacinths so we should see lots of colour in spring 2013. This work was made possible by the kind sponsorship of The Red Lea Hotel, many thanks for their continued support. Work was completed in 2012. On SATURDAY JULY 12 2014 there was a display featuring the activities of the Friends group in the Gardens staged in the large shelter in the Italian Gardens which is 100 years old and newly restored. The restoration work was to a very high standard and much admired. In May 2007 the Friends of South Cliff Gardens were pleased to receive news that they would be receiving a Big Lottery Fund grant of £9950 as part of the Breathing Places grants programme to create a bird friendly wildlife garden in St Martin's Square both to improve biodiversity and wildlife habitats and to increase local use of the Square. Before the project began St Martin's Square was underused, having just a strip of grass with a flower bed, a few trees and a privet hedge. Tall buildings often restricted the sunlight in winter and there was little evidence of wildlife within the Square.The Big Lottery Fund grant allowed the Friends to create a wildlife garden by planting bird and insect friendly plants and shrubs, setting bird boxes in existing trees and creating flower and shrub beds around a bird feeding area in the centre of the Square. 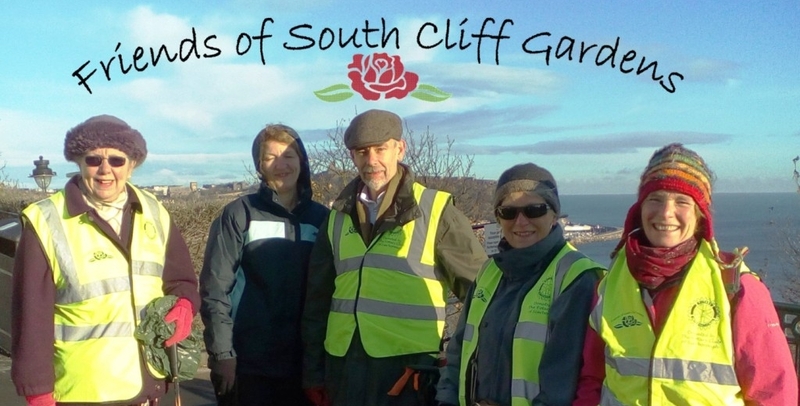 Volunteers were involved in the project from the start, designing the garden, collecting data, designing the benches and birdfeeders, choosing shrubs and plants, making bird boxes and planting the shrubs. The eye-catching bird feeders and a custom built curved bench as well as a Noticeboard displaying information about the Square and the Friends group now encourage local people to spend time in the Square and have made the project a huge success. Alfred Shuttleworth was a successful businessman from Lincoln who bought Red Court on the Esplanade in 1905. Across Holbeck Road was a house called "Holbeck Hurst", owned by Robert A. Marrillier, Mayor of Scarborough in 1896/97. Soon after Shuttleworth bought Red Court he purchased and demolished Holbeck Hurst in order to improve his view and in the empty space he created a garden called "Redcourt Garden"
In 1917 he presented the garden to the town. The oak shelter was already in the garden at that time so it is around 100 years old. In the winter of 1937/38 a corner was created as a miniature rock and water garden with summerhouses, boathouse and bridge to scale. This work was done by the Council. Alfred Shuttleworth’s gift is still being enjoyed by residents and Scarborough visitors. His other gifts to the town include Holbeck Clock Tower and the statue of Mercury in the Italian Gardens. In 2009 funding of £2500 was obtained from North Yorkshire County Council to restore the miniature garden.The new viewing area designed by Richard Flowitt, railings created and installed by blacksmith James Godbold of Egton.